The chimes of Big Ben have stopped for what is thought to be the longest time in more than two decades, so engineers can inspect its clock. 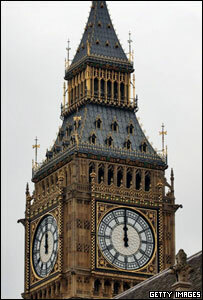 The St Stephen's Tower bell and clock, at Westminster Palace, stopped after the 0800 BST chimes on Saturday and the hands moved to the midday position. Engineers are due to restart the clock at about 1600 GMT on Sunday. The chimes were silenced for longer in 1983 when the clock's hands were removed for new gilding to be applied. Extreme heat and snow have caused short unplanned stoppages of the Great Clock. The last time this happened was in May this year, when engineers said high temperatures of 31.8C (90F) could have contributed to the clock failing for an hour-and-a-half. This weekend, specialist engineers are carrying out out a thorough internal inspection. Mike McGann from the clock's maintenance team said: "There is a lot of strain... on that clock and obviously we're quite concerned that it's strong enough to maintain it. "There is nothing actually wrong. It is a routine maintenance that happens every 15 or 20 years." While the clock is stopped, engineers from the Whitechapel Bell Foundry are also replacing rubber hammer buffers on the hour bell and three of the four quarter bells. The work is intended to form the basis of a new five and 10-yearly maintenance regime to ensure continued reliability for the foreseeable future. The inspection came as the clocks went back at 0200BST on Sunday.